Christmas at London Glassblowing really is the most wonderful time of the year. A visit to our studio in December, set in the heart of London’s art scene, Bermondsey Street, has for generations, been a treasured Christmas tradition for many. What is better than gathering around a warm furnace to watch our glassblowers weave their magic, sampling homemade mince pies, and choosing that perfect piece for a truly unique and special gift? Pieces chosen specially by Peter Layton are on display throughout the Christmas period. In the spirit of our traditional Christmas Open House, studio pieces will also be available at generously discounted prices so please do come along and browse the gallery. Flameworker Philip Vallentin is back once again with his ever popular demonstration of lamp-worked tree decorations on Saturday 1 December. Delivered with exceptional talent and cracking humour, Philip’s demonstration is a real highlight of the season. RSVP here to let us know you’re coming. As well as beautiful gifts from £60, we’ll also feature intricate glass mice by Morag Reekie, beautiful glass lighting by Vezzini & Chen, and new “Ice Cream” designs by glassmaking double act, Elliot Walker & Beth Wood. Carefully selected new pieces have been added to our collection including an exclusive new bauble by Peter Layton. Make sure to check out our Online Gallery Christmas Collection. Wishing you a Merry Christmas and a Happy New Year from the London Glassblowing Team! The gallery will re-open for the New Year on the 5 January. Please note, we will not be offering bauble making sessions this Christmas. We invite you to visit the studio to watch the artists at work or book one of our Experience Day classes. Alternatively, visit the gallery on Thursday 13 December 2018 from 6:00 pm to 8:00 pm for our Blowing by Candlelight evening, and enter to win a chance to make a bauble in our studio. The evening will also feature a chance to watch our glassblowers work their magic by candlelight, homemade mince pies and mulled wine, and enjoy music by our very own live pianist, Mike Shilling. RSVP here to secure your place. Morag Reekie returns to us this Christmas with her stunning glass mice. 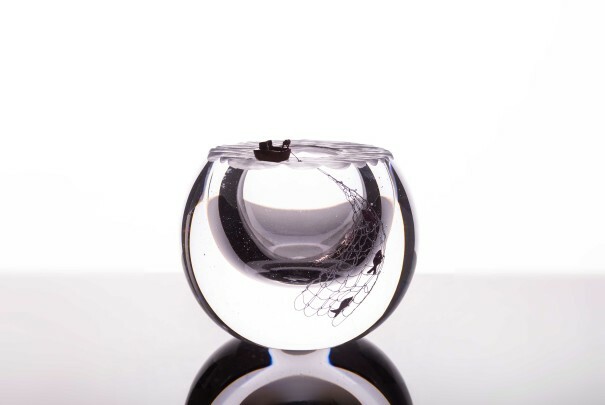 Morag uses old discarded or found items with an unknown history and a story to tell in glass. Vezzini & Chen’s work is defined by the artful marriage of hand carved ceramics and blown glass. 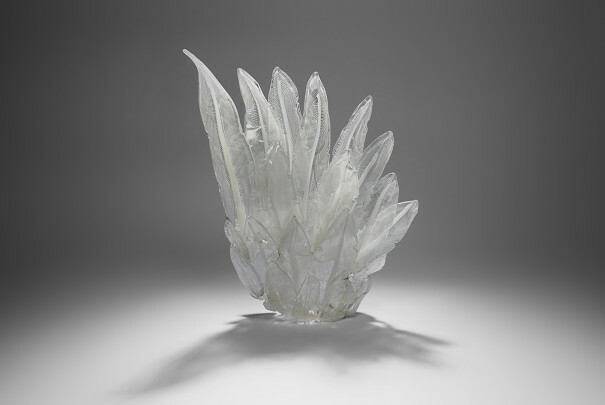 The collections tread a fine line between functional and conceptual, with the design duo creating sculptural hand crafted lighting, glassware, interior accessories and installation pieces. 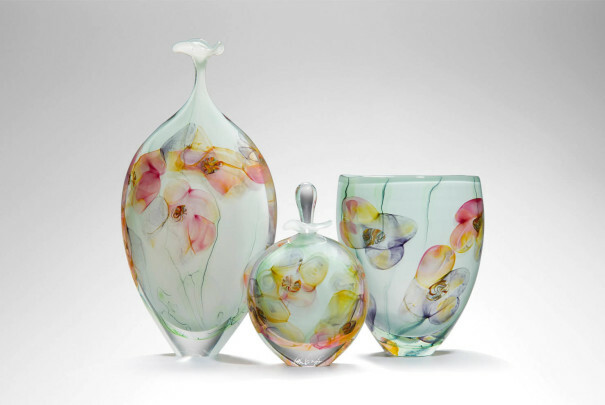 Ruth Shelley specialises in contemporary glass design. 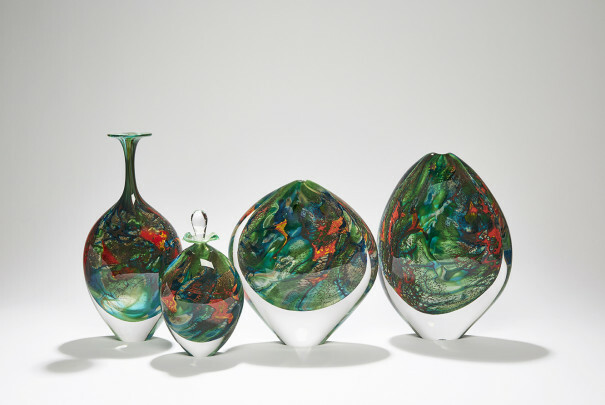 Her works’ signature is the use of vivid, dramatic colour in kiln formed glass. Taking her cue from her love of traveling, Ruth Shelley’s inspirations derive from her observation of colour, balance and tone of nature. Through layered glass she creates a dialogue of lines, patterns and colour. Ruth always observes how the colours and layers combine as a whole, and how light illuminates them. Philip Vallentin’s endearing flameworked tree decorations will be available in the gallery, alongside his hugely popular and particularly charming animals.